This earthbag house withstood heavy rains and a recent 6.1 earthquake. As far as I know, mine was the second earthbag structure to be built in Turkey, and it was met with widespread skepticism. With frequent earthquakes, severe flash-flooding on the south coast during the winter months and rising damp, many thought the house would either ‘melt’, slide or be shaken to the ground. 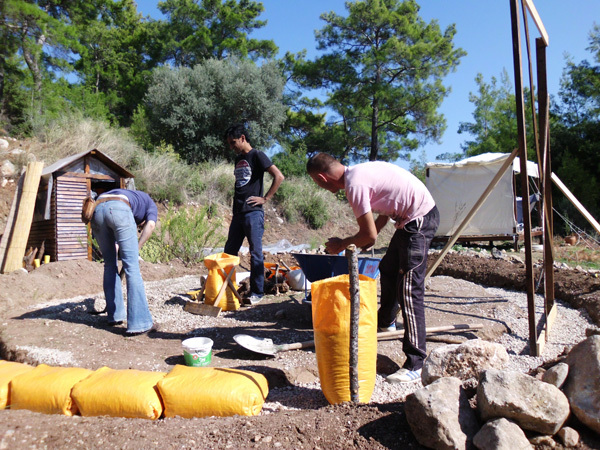 Earthbag foundation made with gravel-filled bags on a rubble trench. Finding the right foundations was crucial. To complicate matters my project had a goal of zero concrete and I had zero building experience. After some frantic research I decided to try a stone and gravel filled trench with gravel-filled earthbags for foundations. The house has a diameter of 6 metres and is circular for maximum strength. After a winter of deluges, unprecedented freezing nights and last week a 6.1 earthquake, the house is still standing not only strong, but dry. To the consternation of every builder in the area I had laid a juniper wood floor about 20cm above the ground. It is still bone dry underneath. The rubble acts as an excellent sieve and any rainwater simply washes around the foundations and out. For wet areas gravel is definitely the way to go. 1. We dug a trench half a meter deep. It was wide enough to allow 15cm on either side of the earthbag to prevent water wicking up. 2. The bottom 2/3 of the trench was filled with smallish rocks from the surrounding land. 3. The rocks were covered with a layer of smooth gravel to prevent the PP bags (polypropylene) ripping. 4. Standard PP sacks were “double-bagged” (one bag inside another) before filling with gravel. 6. Two layers of gravel-filled bags were laid with barbed wire between courses. The first layer started below the existing grade, the second layer above the existing grade. I would have preferred to do 3 layers of gravel bags, however we ran out of gravel. Two seems to have worked just fine though. We didn’t add a French drain. In a system such as this with gravel bags over a rubble trench how would you finish the exterior? 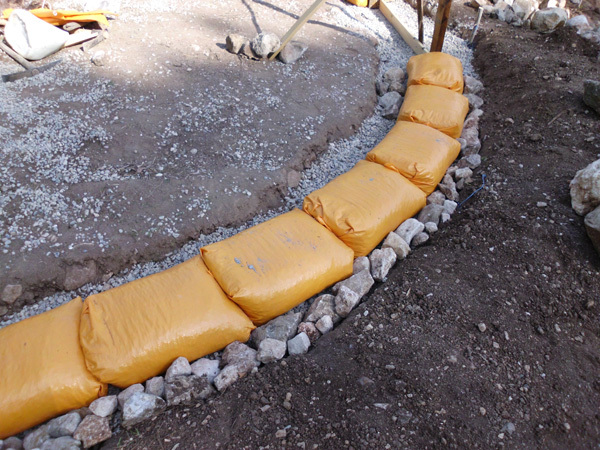 Plaster would have to extend over the gravel bags to protect from UV light and reinforce the bag but what happens at grade where you run into gravel (the rubble trench slightly wider than the bag walls)? Does anything cover the exterior gravel to prevent shifting and exposing the lower bags or to prevent dirt and other debris from filling the cracks and reducing the drainage capabilities? Here are towo options: 1. plaster the gravel bags or 2. cover with plastic barrier and berm with earth and grass that slopes away from the building. Hello Owen, I am currently digging a trench for my earth bag home (5m diameter) in sandy soil that has structure ( the sides of the 60cm trench do not cave in). I was just going to fill with rubble then gravel then start laying the bags as per your directions but Im wondering if I need to line the trench with carpet or something to stop it potentially filling with the fine sandy silt and clogging up. The sand is extremely fine (at the base of a sandstone mountain range) but it still seems to have structure. That’s best but if it’s just a low cost simple structure then I wouldn’t worry about it unless you’re in a rainy area and are concerned about clogging a French drain. I would like to know if you offer workshops about how to build earthbaghouses. In Turkey? Try to contact the author of The Mud Ball who built this house. If she’s not teaching courses, that’s okay because we have loads of free info online that explains every step with videos, etc. Be sure to add a concrete bond beam for safety. Then watch the videos, etc. and then build a little tool shed to practice the basics before building your home. Build small. Don’t attempt too large of a project. Remember to use proper reinforcement in earthquake zones like we do in Nepal. I have a question about radiant heat flooring. We live in a hot, dry climate, and were we building in our current area, we wouldn’t even consider putting in radiant floor heating because it so warm here. But if we were to build at a slightly higher elevation, where the average winter low was about 30 degrees, and the summer high temperature was 96 degrees, in your experience, would that be cool enough to warrant radiant heat flooring? Or would it be a waste of money and effort? In what way do you think that the thermal mass of a earth bag home built mainly to stay cool in the summer would be affected by (what seems to me, at least!) a rather cold winter? Thank you for you input. Thick, high mass earthbag walls, especially with foam board insulation on the outside and thick roof insulation, are very energy efficient. I suggest talking to people in the area who have already installed radiant heat systems and compare their results with similar houses that use other heating systems. It partly depends on the size of the home, solar gain, energy ratings of doors and windows, etc. I’m planning a straw bale chicken coop, using two-string bales which are 18 inches wide. The outside dimension of the building will be 9′ x 12′. The walls would be load-bearing. I want to do an earth bag foundation. What are some ways of attaching toe ups on top of the bags? Would it be feasible to skip the toe ups completely and use polyester strapping underneath the bottom course of bags and strapping down the first course or two bales? I have found lots of references to earth bag foundations with straw buildings, but I’m having trouble locating any details about the interface! Thanks. Toe-ups are not needed between the two. Use strapping under the gravel bags and over the top plate on the bales and cinch it down. You can also use 1/4″ poly rope with a trucker’s hitch. Good Sunday, Many persons are warning me that if I don’t use a metallic wire mesh for the entire area of ​​the foundations of the house, then the floor will certainly have problems and rifts, especially in sismic area. It’s usually only used on driveways or other areas where there are heavy loads. No one else with earthbag houses has told me about cracked floors (but maybe they did crack and didn’t mention it). Ya I mean something like this … Even thicker. I am currently involved in a project that has set it’s sites on designing sustainable housing in third world countries as well as any location that may be susceptible to earthquakes. My question regards the barbed wire in between the layers of earthbags in the foundation. I am assuming the barbed wire is placed in order to keep the layers of PP bags together, but wouldn’t this risk tearing the bags? Yes, the barbed wire prevents slippage of bags. The bags won’t tear much because woven polypropylene is incredibly strong. Just try and tear it or pull it apart! Also note, the barbs are embedded in compacted clayey soil, not just the bags. This adds to the strength. Get 4-pronged barbed wire with good sized prongs and you’ll see it’s incredibly strong. Use two strands that continue as long as possible. I like to pin the barbed wire in place with nails. Overlap the ends. Watch out for low quality barbed wire in developing countries. Some of it is thin and weak and prone to rust. A lot of builders are now adding vertical rebar pins down through the center of bags, especially next to doors and windows. 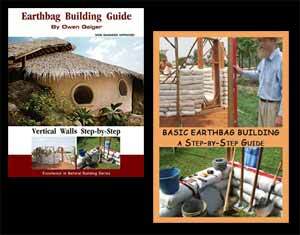 More details for building with bags in seismic areas at Earthbag Structures.com. Don’t hesitate to ask questions. Hello Owen; I am in the stage of planning of building a house with earthbags in Chile too (I read about the anti seismic dome you worked some years ago with another Chilean guy). The place where I will build the house is in the central south area which is quite rainy and prone to earthquakes. I am searching the best alternative for the foundations of my prototipe which resembles the spiral dome magic model on this page. I read about the dome you designed for this other guy and was wondering if it is possible to get the design of the foundations for that dome?. The area where the house will be is near several volcanos, so getting lava rock shouldn’t be complicated. You want to use a fairly small, mostly symmetrical design for seismic areas. The design you mentioned is not the best, especially since there’s a living roof on part of it. You want lightweight roofs. Here’s the basic dome concept I was proposing: rubble trench, reinforced monolithic slab floor/foundation, double ferrocement dome (rebar and mesh with scoria bags between). A structure like this would slide back and forth on the gravel and hold up to most any earthquake. If you’re serious about this then you can email me. I’m not doing custom plans any more, but since this plan was already worked out then yes, I think I can help. Just email me. Is there a safer style of Earthbag home that can withstand earthquakes in a cold mountainous region of Chile? Can earth bags be used to help insulated a geodesic dome structure, both in foundation and walls? I am an absolute builder novice but want to relocate with my entire family, grandma and all, to Los Andes, Chile but I fear I may be risking them in an earth bag house so I was going to opt for a geodesic dome or a series of yurts connected and incorporate some earth bag techniques so I could reduce build out costs. A few years ago I designed a super safe earthquake resistant dome for Chile. The guys I was working with suddenly quit writing and I never heard what happened to the project. Here’s the design in a nutshell: 1. reinforced concrete monolithic slab sits on top of 12″ or so lava rock. The lava rock (scoria) insulates the slab and allows it to shift back and forth in a quake. 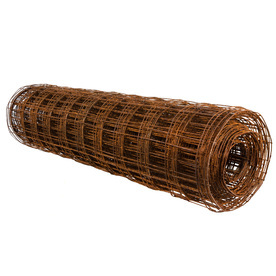 2. rebar from the slab is bent and curved into the desired shape and covered with mesh. 3. scoria bags are stacked against the rebar frame, 4. a second layer of rebar that’s also protruding from the slab is bent and curved over the top of the bags. (Actually just 2′-3′ pieces are protruding from the slab and long rebar is tied to them.) Baling twine is used to tie the inner and outer frame together. Cover the outer layer with mesh. Then build ferrocement eyebrows over doors and windows. (Search our blog for info about eyebrows.) Then plaster as usual. A mortar sprayer is easiest on the interior. This would create a double ferrocement dome with 15″ of lava rock insulation. Lava rock or scoria is rot proof, fire proof, not attractive to pests, etc. Supposedly lava rock is available in Chile according to the guys I was working with. Email me if you’re interested and maybe we can revive this design. But first, make sure you can get porous lava rock. Yes, I’d like to see the finished thing too:) Unfortunately in February I ran out of money and am currently working to save up cash. I got the first layer of mud plaster on, but a lime plaster coat still needs to go over top. Windows also still need fitting. In 6 weeks time I’m back on the land to complete it, after which I’ll post the photos. Thank you so much for telling Owen about your project! These are the most important pieces of information right now, determining how well earthbag works in earthquakes. It is so sad that so many builders think concrete equals strength, whereas a drainable footing is much superior in damp, freezing regions. The rubble trench is also much superior for dangerous expansive clay soils- the clay can expand in between the rocks or rubble without breaking the footing apart! I would love to see a photo of the finished building. The other earthbag bungalows were built by Chris Shaw for his beautiful alternative camp in the Kabak valley, Turkey. You can see them in the accommodation section. He made a great lime finish for the walls. Chris’ foundations are traditional concrete, not gravel. Hey Kerry, we’d love to see a photo of the other earthbag house in Turkey. Has anyone else built earthbag houses there since you did yours? Builders take note: You can use these same earthquake resistant gravel bag foundations with other building materials such as straw bales, etc. The same type of foundation is being used in Pakistan, a high risk earthquake zone. This system has passed a shake table test in the US.